Last week, we informed our readers that we would be accepting any extra garden tomatoes they might have growing. For me, there are certainly many more green tomatoes on the vine than there are red, but otherwise it seems that the fresh garden tomato season might be on the verge of hitting its peak. There is nothing better than fresh garden tomatoes on your salad. You grow it, you clean it, you prepare it, you eat it. Perfect! It just tastes like summer. 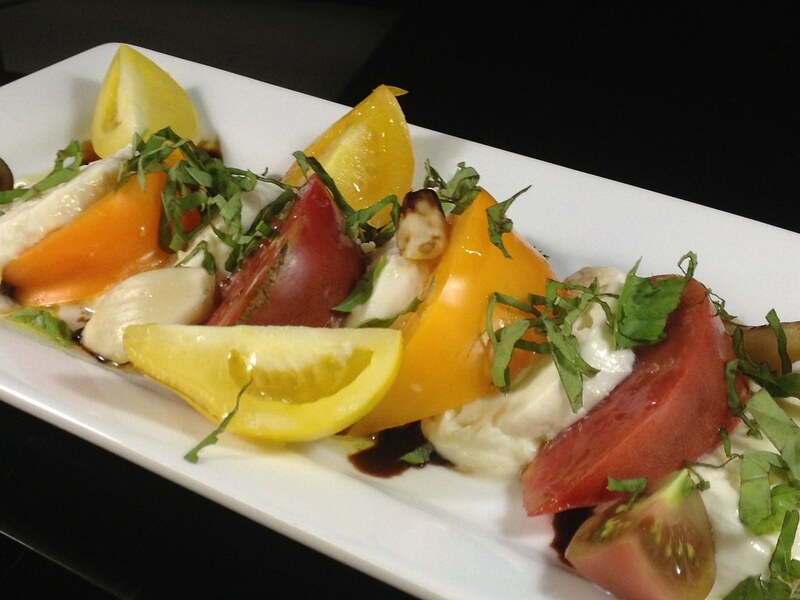 So this week - and likely most of August - we bring that taste to you by featuring our caprese salad. Although we recommend it as a cold, light appetizer on the menu, this dish can also be enjoyed as your meal or alongside your entrée course. We also make our own fresh mozzarella for this dish, here in our kitchen. We could buy a pre-made fresh mozzarella log in a bag, take it out and cut it, but that would be too easy. Instead, we purchase cheese curd. The process itself is pretty neat. First, you need to warm water to the desired temperature (we can't share all our secrets, but with a little homework you could find out for yourself). Toss in the cheese curd and some salt. Then from there all you need to do is knead the curd, fold it, stretch it, knead it again. Let the newly formed mozzarella soak in it's own brine and ta da... you have housemade, fresh mozzarella! Add in chiffonade of basil, olive oil, balsamic creme and cracked black pepper, some freshly picked organic heirloom tomatoes and you have a meal fit for your very own dining room table. It is like eating at home, only you don't have to do any of the work or cleanup. Come taste summer and these delicious tomato flavors! Be sure to stop in soon... because they will be gone before you know it!